La Crónica Verde gives a short round-up of what to expect this spring. March 8th, 2010	According to the INM, February was the wettest for 30 years in Spain. See also rain in Andalucia in February. This comes after a very wet January. March has begun with heavy rains and snowfalls. When will it end? This winter is proving remarkable wet. 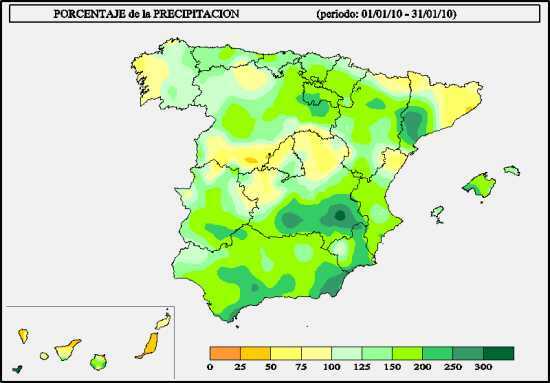 Precipitation this year in southern Spain has been so far the highest since 1963, with Sevilla receiving more rain than in the last 60 years. According to the INM, in Spain as a whole, January was 43% wetter than average for the period 1971-2000. The above map shows how this played across the country in terms of percentage of precipitation above average. 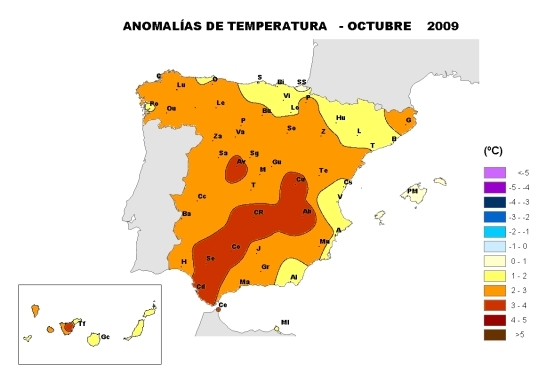 Albacete received for instance, more precipitation since 1941 when this series of records began. In the same province of Castilla-La Mancha, the rains have helped save the much maligned Tablas de Damiel. Unsurprisingly, reservoirs are overflowing and many have had to open their gates. Temperatures have so far been normal. Summer has seemingly refused to die this year in Spain. Official figures show that October was the fourth hottest since 1971, after 1995, 19997 and 2006. In some areas, temperature were as much three degrees above average. Rainfall was slightly below normal values. These temperatures had been predicted at the start of the month. In a similar vein, temperatures in August in Spain were “extremely hot”, being the third highest since 1970 (2003 and 2005 were hotter).